Last week found me in Houston. And for a few hours (see above) I got to go explore their expansive bayou greenway system - which by 2020 will be the largest network of trails and parks in the nation. That may shock you about Houston, it's great trivia to pull out in a room with transportation friends. But the primary reason I was there was to look at the ambitous realignment of Houston METRO's bus system, a complex multi-year project to make buses run more efficiently, faster, with more frequency and routes that make more sense for the city. It's already reaping great rewards and sweeping the nation with ample positive press so we thought it would make a great Streetfilm. Thus, thanks to our funding partners TransitCenter in a few weeks we'll be posting a film to tell the story. 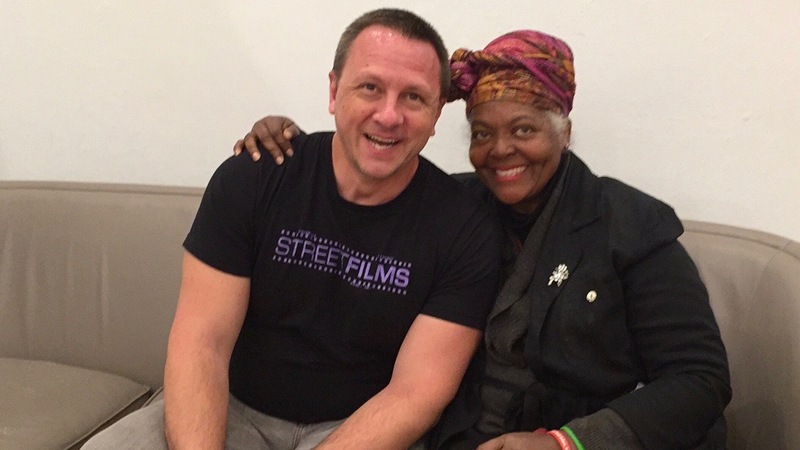 This photo is me with Janis "Bus Lady" Scott who is just one of the great folks I got to spend time with on the streets of Houston riding transit. I think Janis just might be Jane Jacobs reincarnated. She was so charming I might post a bonus Streetfilm segment just on her after finishing our primary feature on MetroBus. 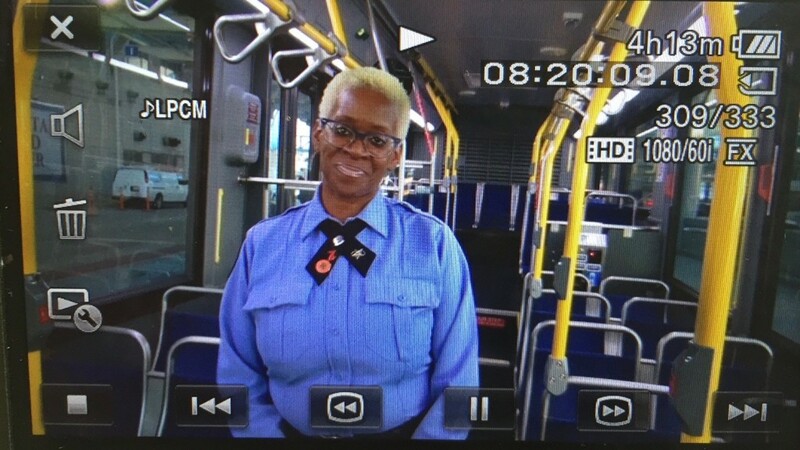 I also got to do one of the more amazing things I have ever been allowed: I rode in an empty bus around downtown Houston just to get some driving shots after interviewing Cara (below) an energetic bus driver at Houston Metro who helped out planning some of the new routes. You'll meet her, the "Bus Lady" and many others in our film. While I was there, I was a guest speaker at Houston Tomorrow's Streetfilms screening at the Rice University Media Center. Always nice to see our films playing up on a handsome big screen with lots of folks. Furthermore, I was very excited since Jay Blazek Crossley their Executive Director, chose a great slate of Streetfilms mostly pulled from this blog post, which I've been cajoling communities to play. You should, after all they are free to screen. Of course even with the great bayou greenways project and the new bus system alignment, Houston still has an enormous challenge rejecting its asphalt culture (see above just a short montage of traffic on the I-69). In Houston I saw ample examples of how car culture can destroy cities and eat up space to make places inhospitable to living. I took this crazy photo of a Chase drive thru/ATM which sports 14 drive thru lanes. Yes, fourteen!! (only seven are shown in this photo.) Although many of the lanes now appear closed off, I ask: when was this ever okay in any place, in any era?? When I first saw this structure I thought it was a downtown toll booth with a secret entrance to an underground Houston road! 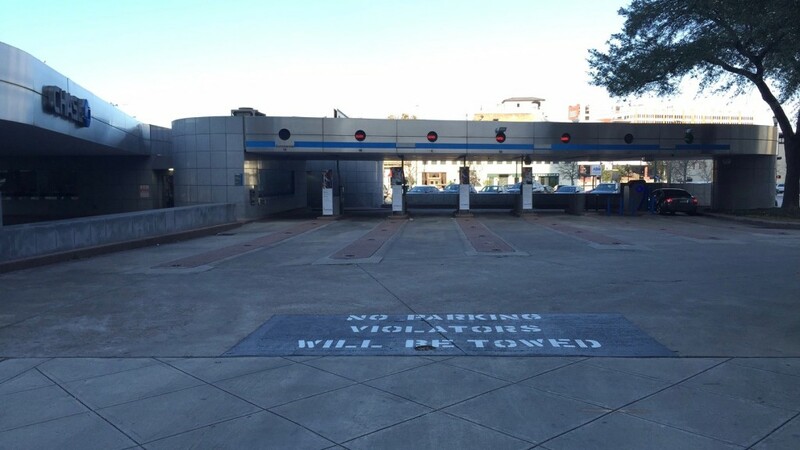 And of course, Houston has a mega number of parking craters and you can see the city was a strong contender in the Streetsblog's Parking Craters competition. There are lots of lanes of highways, everywhere. However, optimism abounds as new Mayor Turner has been capturing the attention of the transportation world saying Houston needs to look at mobility and get to funding more alternatives to the car. In his recent comments he suggested that Houston needs "a paradigm shift" when it comes to transportation. Finally, I'll end on this note: when you're in a new city, sometimes the outside observer sees things that are cool that local residents may shrug at. Here's another first for me, the below shot shows what Houston has done at intersections where streets cross the light rail lines. Yes, they put red boxes around them. 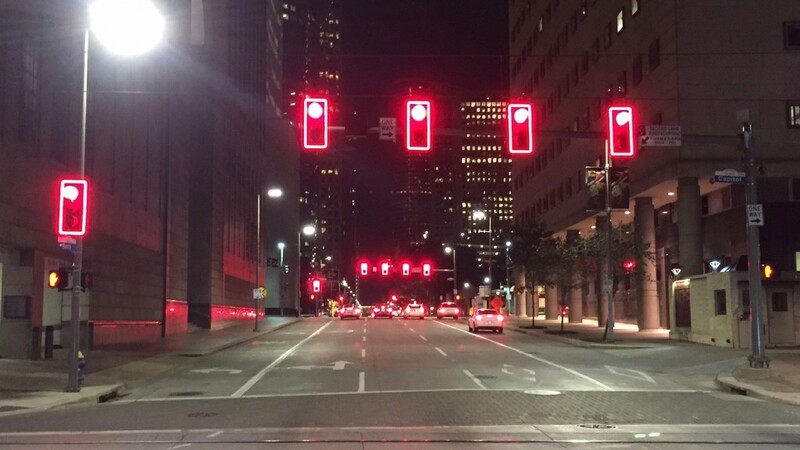 I guess this is a red light on steroids?!? Of course that makes me fond of my first trip to Houston a few years ago, where on a hot midnight summer day, I spent some time admiring the fountains and art that surround the Main Street transit stop and turned it the shortie below. Yeah, I am a transportation geek at heart. Posted in Streetfilms News. Tagged as bayou, Bayou Greenways 2020, Bus Lady, buses, highways, Houston, Janis Scott, METRO, Transit, transportation.